This market research facilities project was a complete installation and involved the partitioning of space to create 18 separate rooms / areas. Lbconstruct fitted the flamingo office in 2003. They have since expanded & came back to Lbconstruct to fit out the new office, recycling as much of the materials from the old office as possible. The reception desk was made remodeled from the previous desk & re-sprayed. The bi folding doors were made to create moveable partitions between rooms. The bar cabinet & shelves was made from high gloss spray finished MDF. 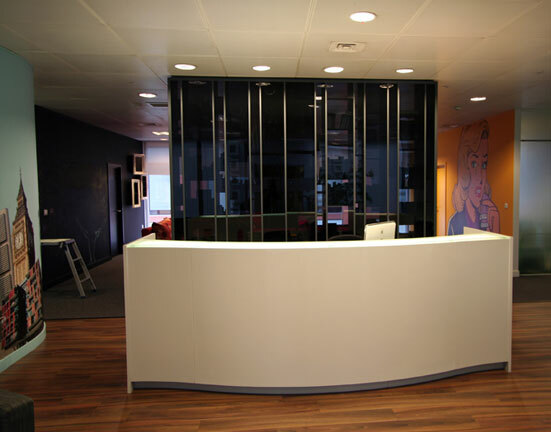 The viewing facility was made re-using glass panels and desking from the previous office. The bookcase was doubled sided acting as a partition between the reception area and the pool table area and was made from spray finished MDF backing on the reception side. The kitchen was made using off the shelf units and doors with a Walnut breakfast bar.